Majorca is a summer holiday favourite, be it a family getaway or a fortnight of partying with friends. Cala D’Or is a fantastic choice for families, or those that like things a little less touristy. Summer brings an abundance of flights over to Palma airport, and Cala D’Or is just over an hour away, on the south west coast. A great way to get out and about once you’re in resort is to hire a car, and if you’re able to, I’d highly recommend it. Majorca has some beautiful countryside to explore, away from the main resorts, and has kept a lot of the old Spanish charm. In-keeping with the laid-back vibe in resort, why not make your travel plans equally as relaxing? Whilst getting to and from the airport can be stressful, there are ways to minimise the stress and save money too. Parking at Stansted , which I’ve also used in the past. Cala D’or is all about the beach, and you have many to choose from, with white sand and many facilities to make a day’s sun-lounging go without a hitch. 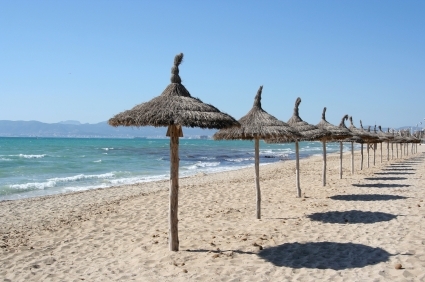 The largest beach in resort is Cala Gran, but be aware this can get crowded during summer months. To cool down in the summer heat, you have a choice of water-sports for a splash around, or alternatively, if you want to keep dry but still see some underwater residents of the area, I’d highly recommend a glass-bottom boat trip. If sitting on the beach, or splashing in the sea gets a little tiresome, there are some fun excursions for all the family, and one of the most popular is a visit to the Caves of Drach at nearby Porto Cristo. Here you’ll see lots of strange rocks and a massive underwater lake. Another certainly worthwhile day out is a visit to Palma, with its huge gothic cathedral and sightseeing opportunities. There are also great shops in the city, if you fancy a bit of retail therapy. Nightlife in Cala D’or isn’t loud or raucous, and more about having a quiet drink, a nice meal and watching the sun go down. For livelier clubs and bars, you’re probably better off heading to one of the larger resorts, however if laid-back is what you’re after, this is perfect. I’d highly recommend trying some traditional Spanish food, such as paella, however, if that’s not for you, you won’t go hungry, as there are plenty of international menus for everyone, especially around the marina area. In my opinion, Cala D’or is the perfect choice for a sun-drenched, good old family holiday, and with extras to add onto travel plans, making the whole experience cheaper, what more could you need? If you’re heading out of airportsat the Capital, you don’t lose out, try out Car Parking Gatwick for great value for money. For family fun in the sun this summer, it has to be Majorca.